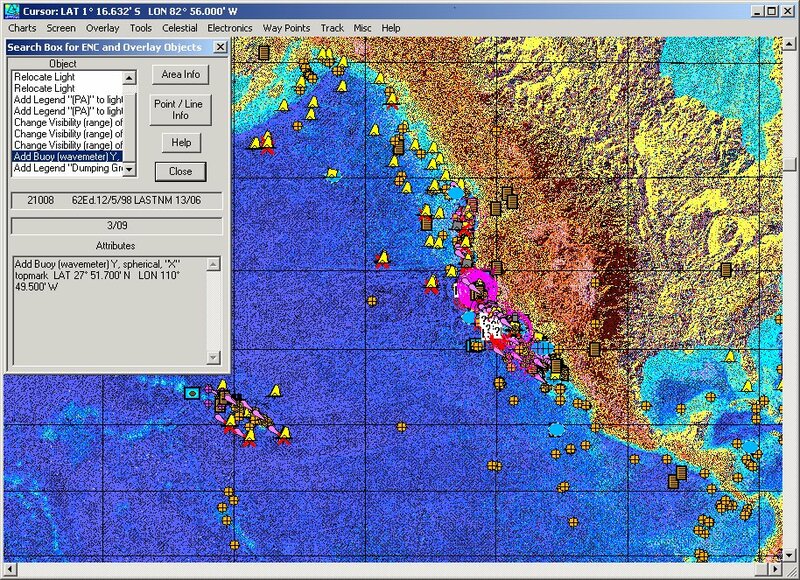 NavPak (Professional Edition) will read and plot Notices to Mariners (NTM, NM, and LNM) and Light Lists (LL) from NGA and USCG, giving world wide chart updates. The symbols are plotted on the NavPak Overlay which can be saved and recalled later. The overlay can be shown over a raster or vector chart, or on a plotting sheet screen. Some info on the NTM and light list is not shown on the chart, so they should all be used together for navigation. Detailed symbols and lines show what is in the NTM or light list at a glance. The symbols can be a rock, wreck, obstruction, or a structure such as a buoy, pile, post, tower, platform, pyramid or building. Then a light, RADAR reflector, fog signal, AIS, Racon, Radio beacon, and top mark are added as applicable. Other symbols show where notes, tabulations and chartlets are applied to the chart. A red X is shown where objects are deleted or relocated. When you double-click on a symbol, the attributes are shown in the NavPak Search Box. A background map is a good way to see a whole district. The Weekly Light List for District 11 is shown above. Open a chart, then select a NTM or light list file using a file selection dialog box, and in a few seconds, the info is plotted as symbols. To combine NTMs and LLs, open one then the other, and save on the same Overlay. Above is a screen shot showing Notices to Mariners at the northern approach to the Panama Canal. This chart would be tedious to update by traditional methods (pencil & dividers). This screen shot shows the same area as the previous one with the chart hidden. At anytime you can hide the chart or the Overlay to easily distinguish what is on one or the other. The magenta lines show a traffic seperation scheme. The cyan lines are undersea cables. Other items shown on this NTM include AIS beacons, shipwrecks, buoys, soundings, notes, and labels. Notices to Mariners and Light Lists are available world wide on the USCG and NGA websites. This data can be queried by area, district, and/or chart number. Since the data comes directly from the NGA data base, it is up to the minute when you download it. The screen shot above shows a query of a 10 x 10 degree area to include most of California and part of Mexico. Many of the records will show up outside of the query area. This is because some records will apply to small scale charts that overlap the query area. Using a small scale background map, we can see that the query of California and Mexico includes Super Buoys from Alaska to the Caribbean. Other symbols include rocks, wrecks, obstructions, notes, labels, and chartlets. A red X is shown where items are deleted or relolocated. The Control Points of lines and areas, such as boundaries and pipelines or admistrative and traffic areas in the NTM are plotted as colored symbols and lines. You can also open and plot NTMs and Light Lists on the same Overlay as a composite. The screen shot above shows the light list plotted on a NOAA ENC chart. When you double-click on a symbol, the info from the light list is shown as text on the screen. A green circle is shown around the symbol to confirm selection. You can also add your own notes, symbols, lines and polygons to the Overlay as shown in the lower right of the image above. Near the top of the screen is the dialog box used to draw and edit lines, symbols, and text on the Overlay. A similar dialog box is used to draw and edit polygons on the Overlay. The screen shot above shows a NOAA raster chart (RNC) with the light list overlay. The light in the middle of the jetty shows as Yellow on the chart and white on the light list. This indicates a descrepancy in one or the other. Both agree on the Horn at the end of the jetty, but as shown on the previous screen shot, all the attributes of the horn are shown in the light list but not on the chart so that one supplements the other, and both should be used together for safe navigation. The screen shot above shows another NOAA ENC. 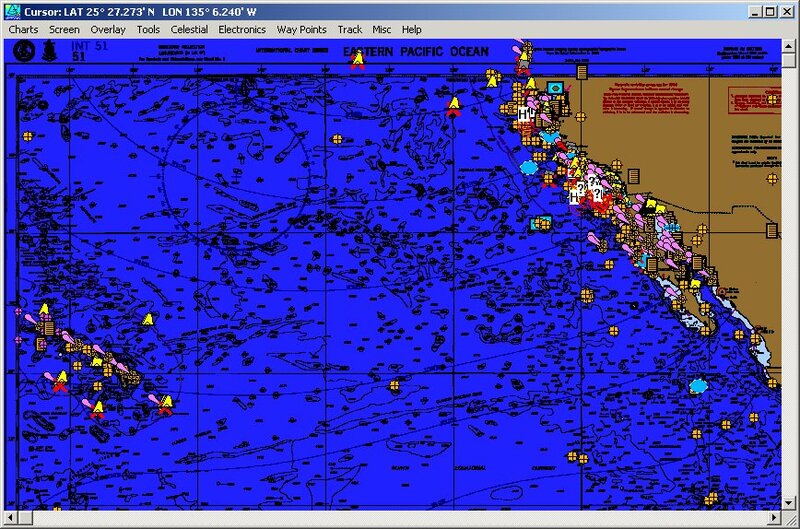 This is the type of charts used in ECDIS systems. The light symbols on the ENC are pointed down to the right, and the symbols from the light list are pointed up to the right so that both can be seen. In the screen shot above, only some of the lights are shown on both the chart and the light list. They are the red and green lights near the top center and the white lights near the bottom. 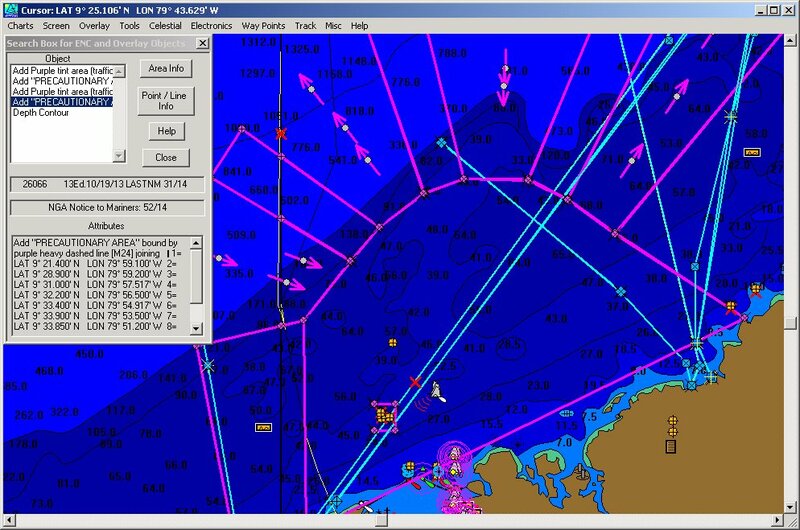 The charts in ECDIS systems are supposed to have all the latest information, but the NTMs and LLs will be more recent than the chart. � If an ATON is deployed on a navigational hazard, then it will probably show up on the�NTM�or LL first, and may never be shown on the chart. Some of the commercial contracts, such as towing, are requiring that vessel operators have updated paper charts, regardless of whether or not they have an ECDIS. �In this respect, commercial contracts supersede government requirements. � So, the best way to satisfy the auditors, commercial contracts, and the common sense of navigation is to have a full set of updated paper charts. 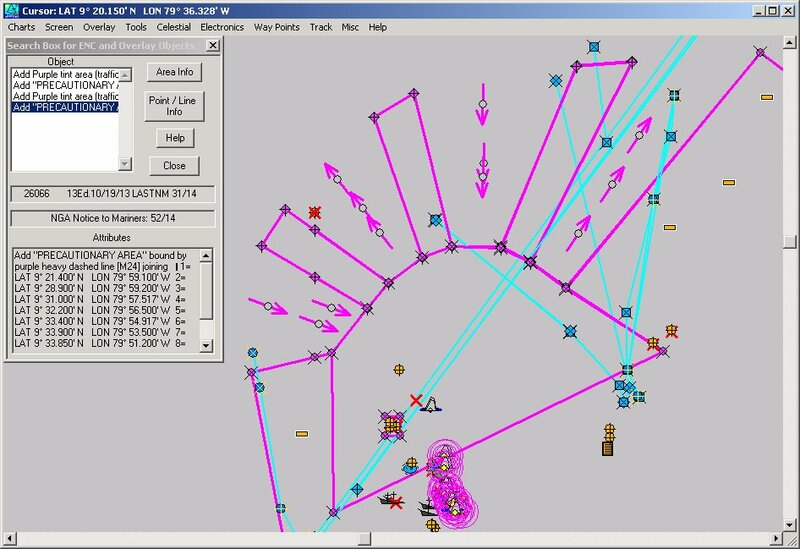 ��The Graphic NTM and LL features in NavPak will make it much easier to update your paper charts, and combines all this information on your digital chart.